Welcome to CVP Medical Technology. 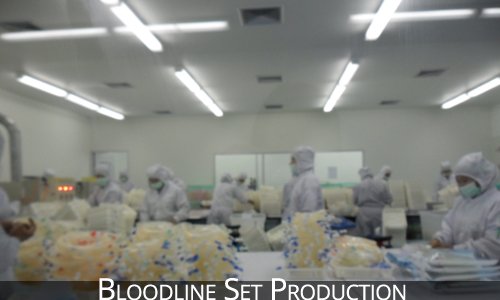 We manufacture and distribute various hemodialysis products, including hemodialysis concentrate, reverse osmosis system, and blood tubing set, in Thailand. On this website you can find latest updates on our products as well as information regarding the company itself. Any inquiries are always welcome here. Our contact information can be found below. Should there be any important events regarding our company and products, this section of the website would be updated to inform you of those happenings. Meanwhile, please look around the website to explore our business and we wish you would decide to connect with us. If you are interested in what CVP has committed to do for the society, please visit the corporate social responsibility section under our company profile page. 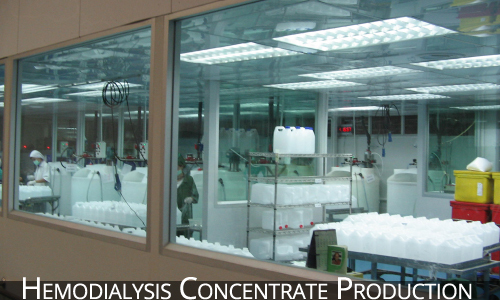 Founded as a hemodialysis concentrate manufacturer in 2000, CVP Medical Technology Co., Ltd. has expanded its business to encompass various aspects of kidney disease treatment. Currently, we supply complete range for hemodialysis products and services including hemodialysis machine, reverse osmosis system and supplies. We also provide after-sale services by experienced engineer team. 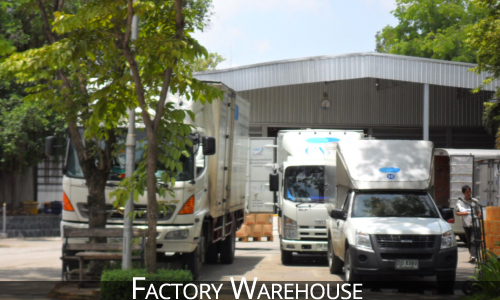 Our qualification can be guaranteed by the following certifications: ISO 9001:2008, ISO 13485:2012 and Thai GMP. We have not only been providing hemodialysis concentrate for our partner hospitals and clinics but also investing our efforts in establishing hemodialysis centers that operate beyond minimum standard, yet maintain their affordable prices. Our goal has pushed us to optimize our production, motivating the invention of series of our new products. 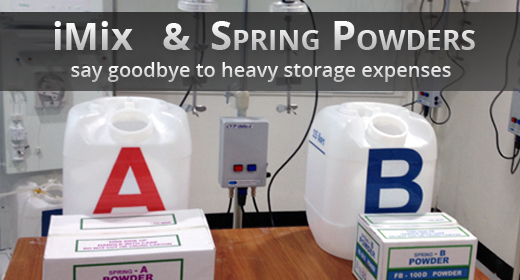 Among our innonations, the two most notable are Spring Powder, a more convenient alternative of traditional hemodialysis solution, and iMix, a carefully-designed portable device used to combine ingredients to make the solution right in the kidney care center. These products are currently in use and have been stated by many of our doctors to be as effective, yet more convenient and affordable. During the great flood of Thailand in 2011 when many companies, including us, could not produce and transport hemodialysis solutions up to the usual expectation, our Spring powder has proved to be sustainable choice for many hospitals and patients even during the critical time. To further respond to the increasing and diversifying needs of the hospitals and patients, in 2011, we have expanded our hardware department to include not only well-trained technicians but also engineers from various backgrounds, who, we believe, can push the process of innovation and development of the company forward. This new hardware department, along with other sectors of our company, including sales, international relations, and many others, will continue to serve the kidney care centers and their patients using our best technology, yet always with friendly care and understanding we have always been proud of. To provide reliable products and services to our customers as an all-around company in the renal medical device industry. At CVP, we believe that if the right people are doing the right job, performance will be enhanced. That's why people who work at CVP Medical Technology come from a variety of background. Our engineering team ranges from technicians who have been working with hemodialysis machines for years to recently graduated engineers from some of the top engineering schools in Thailand. This combination has proved to be the right formula for our goal to both initiate new projects and provide high-quality continuous support. Our sales team is even more diverse, consisting of Bachelor's degree holders in a spectrum of fields. Each sales representative is assigned a target location and product, depending on their specialty, preference, and need. As sales representatives are like gateways of the company, satisfying working environment has brought about a friendly relationship between us and our customers. Other supporting teams including those specialized in accountancy, IT support, and international relations, have made it possible for the company to provide an uninterrupted service to our customers as well as expand our business, both in the domestic and internatonal scale. With past success we have seen, we do firmly believe in our guiding principle: At CVP, diversity and excellence are celebrated. Since its conception, our company has always realized its responsibility towards the society. Specializing in supporting kidney disease care, we have established and maintained a number of non-profit hemodialysis centers. The creation of these centers is driven by our motives to help those kidney disease patients who cannot afford continuous expensive cost that often comes with their treatment. Our centers have granted access to quality kidney disease care for patients, providing them longer and better lives. Our very first center under this model is Hemodialysis Center at Pativej Clinic, located on Phahonyothin Road, Bangkok. 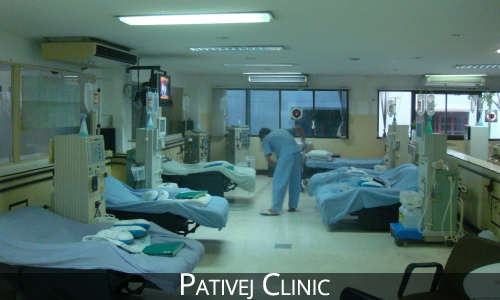 The Clinic, so far, has served thousands of patients. As of 2014, operation procedure of all our self-operated centers follows this model and we plan to sustain these non-profit clinics for the greater benefits to the health of the people. We are currently producing different formulas of liquid hemodialysis concentrate, mainly in two categories: 35x and 36.83x dilution. 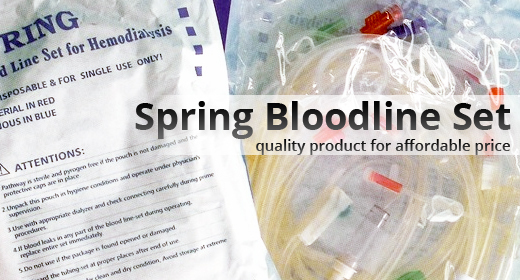 Spring A and Spring B are designed to be used with 35x dilution hemodialysis machine, while Spring AA and Spring BB are designed to be used with 36.83x dilution hemodialysis machine. One carton of our liquid hemodialysis concentrate consists of four 5.5-liter canisters. For all hemodialysis concentrate, we are using an EP/USP grade raw material and AAMI-standard purified water for our hemodialysis concentrate. Our factory is certified by Thai GMP, ISO 9001:2008 Quality Management System, and ISO 13485:2012 Medical Devices Quality Management System. We are currently producing different formulas of Spring powder hemodialysis concentrate, mainly in two caregories: 35x and 36.83x dilution. These products should be mixed with purified water using appropriate mixing machines. 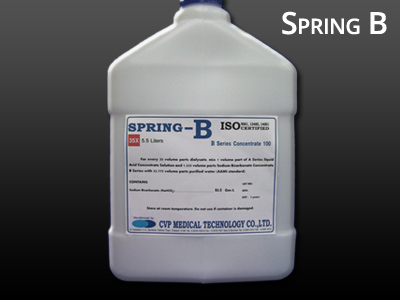 Spring A Powder and Spring B Powder are designed to be used with 35x dilution hemodialysis machine, while Spring AA Powder and Spring BB Powder are designed to be used with 36.83x dilution hemodialysis machine. 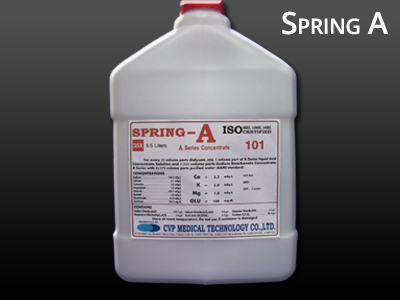 One carton of our Spring powder hemodialysis concentrate can be used to produce the equivalent amount of five 5.5-liter canisters. 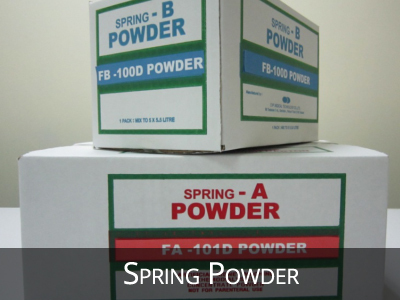 Spring powder is ideal for centers with limited space since it requires much less storage area than the liquid hemodialysis concentrate. For all hemodialysis concentrate, we are using an EP/USP grade raw material and AAMI-standard purified water for our hemodialysis concentrate. Our factory is certified by Thai GMP, ISO 9001:2008 Quality Management System, and ISO 13485:2012 Medical Devices Quality Management. 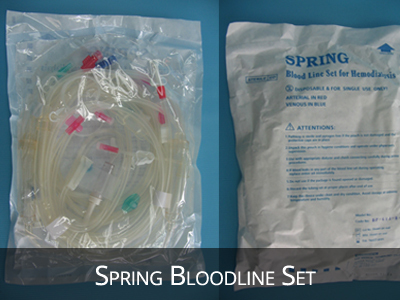 Spring Bloodline Set is manufactured in a standard clean room environment and sterilized by ethylene oxide. 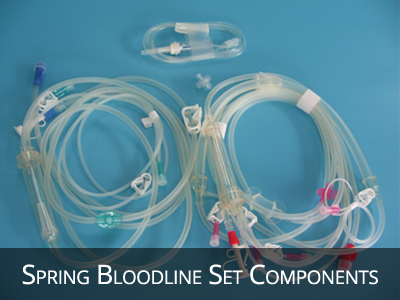 One hemodialysis blood tubing set includes one arterial line and one venous line. Additional accessories such as transducer protector and IV solution set must be specifically requested for some machine models. 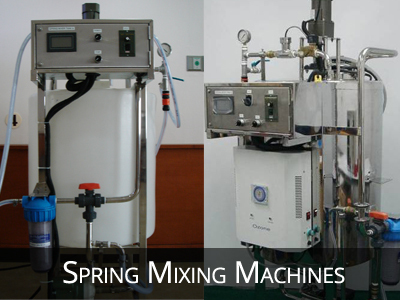 CVP has developed Spring mixing machine for Spring powder hemodialysis concentrate. The dialysis centers themselves can easily mix Spring powder hemodialysis concentrate at each dialysis unit for instant use. The appropriate mixing quantity for daily usage can be tailored upon each dialysis unit. Using Spring powder hemodialysis concentrate and mixing machine instead of liquid hemodialysis concentrate will help reduce storage and transportation expenses. There are two types of mixing machine: Spring mixer A for acid concentrate mixer and Spring mixer B for bicarbonate concentrate mixer. Currently, there are 100-liter and 200-liter mixers available, yet larger-size mixing machines can be requested given unique requirements of individual dialysis units. CVP invented and launched iMix in 2011 to further enhance convenience for our Spring Powder customers. 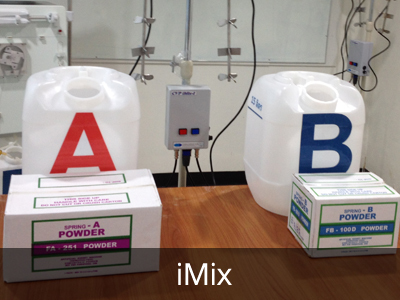 With iMix, Spring powders and purified water can be mixed inside the canisters instead of in the more space-consuming mixing machine. 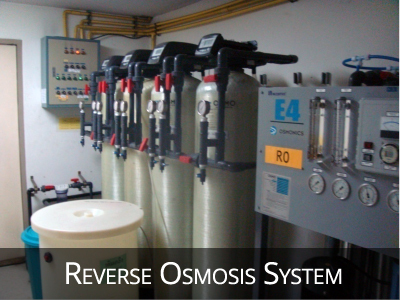 Our reverse osmosis system is used to produce purified water for the hemodialysis machines. Please forward all your inquiries, comments, or any messages to info@cvpmed.co.th or call us at +66 2249 7509. We would love to hear from you. Please note that, in contrast to our website, our e-mail is under the domain cvp.co.th.